With the new $50 Fire tablet setting a new standard for price vs performance, Windows 8 tablets are making another push to scrape the bottom of the barrel. The tablets haven't gotten any cheaper than they were last year, and the specs haven't improved at all, but you can once again find a Windows 8 tablet for $60. An email from Microcenter graced my inbox this morning. 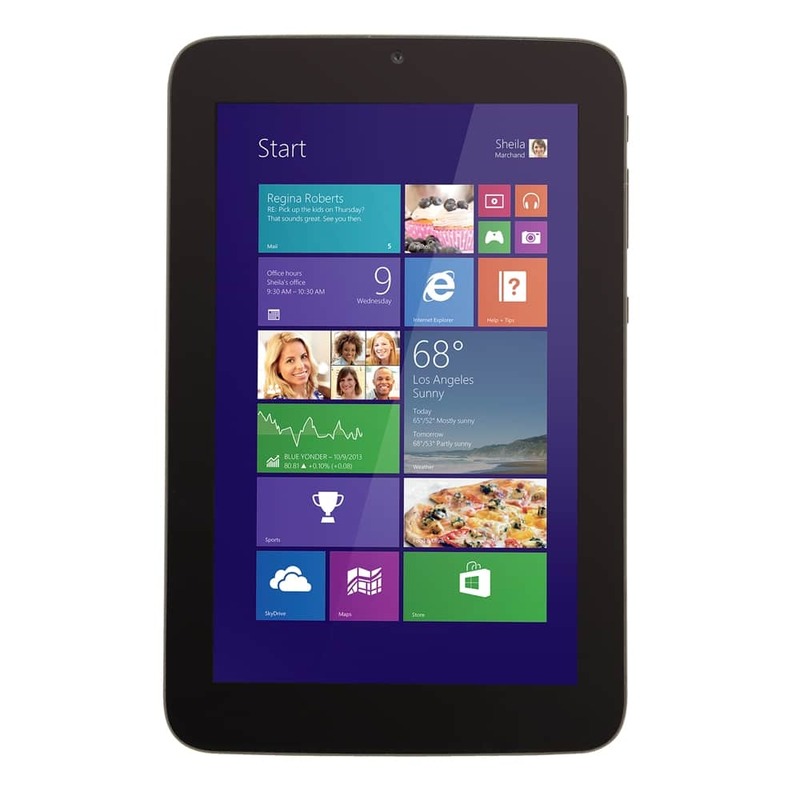 The electronics retailer has the WinBook TW700 tablet on sale this week in-store for $60 (quantities limited). This is a 7" tablet with a screen resolution of 1280 x 800, the same as on the Fire HD 7, HD 8, and HD 10. With 1GB RAM, 8GB internal storage, and an Intel Z3735G CPU, TW700 would make a great Android tablet, but as it is this tablet just barely meets Microsoft's minimum standards for running Windows 8, and it probably won't meet your expectations for performance. While the reviews for the TW700 on Amazon aren't bad, my interests in a cheap Windows tablet are tempered by Chris Meadows' experiences with the $80 HP Stream 7 earlier this year. He was nicer about it than I would be, but even Chris had trouble with the tablet. He didn't think Windows 8 is truly a mobile OS, and he also had problems with the software configurations. But this tablet does run Windows 8, so if you can stomach the low performance then you have the option of installing just about any Windows reading app. Let's just hope those apps work well on such a small touchscreen, though. There is a version of FBReader called (shockingly, I know) FICTION BOOK READER on the Windows app store that runs very well. That resolution at that screen size would make a great reader as long as it has an sd card slot. You can upgrade these to Windows 10, which I strongly recommend, and run them via tablet mode (I would avoid desktop mode). If you do that they are OK, if you run one app only and avoid multi-tasking (it is inadequate as an ereader, as the Microsoft store is fairly limited for e-reading apps). It is not just relatively obscure manufacturers that you can find tablets for at that price (or similar); you can find end of line Toshiba, HP, Acer etc. tablets at 7 – 8 inches. The HP Stream series is probably the best thing HP did in a long time and they should be refreshing it with Windows 10 soon. You’re not limited to the spp store though. These are PCs; they’ll run everything that runs on regular PCs from Mobipocket to NookStudy and coolreader to Kindle. plus native calibre and sigil. Only issue I see is the $60 is only in-store. Yes, they are. However, running software via the desktop mode isn’t the best thing to do, considering how low the specifications are. I think it is best to stick to apps, as you would with a tablet, and the Windows app store is poor compared to Android or even Amazon (the Kindle metro app is woeful, as is the Evernote touch app). The real issue is that full Windows is not suitable for these tablets and you would think Microsoft would develop a version of Windows for tablets as they have for their Lumia phones. Also, touch is poor in the desktop mode, especially on such a small display (you need a minimum of 10 inches). Guys, you do realize that we’re talking about using a 7in tablet to read books, right? Not write them? Plus, Windows has variable screen metrics that makes it usable at most any screen size. As somebody who used a Toshiba Libretto (look it up) I can assure you, you *can* use the desktop on a 7in screen. Just tweak the metrics to 135% or 150% if you’re ham-fingered. We’re talking Windows here, not a glorified phone OS.